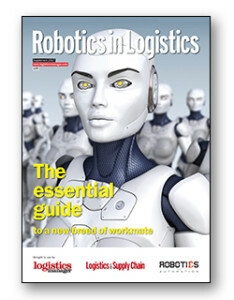 Robotics in logistics : the essential guide to a new breed of workmate, is out now. Urban spaces are battling pollution and overcrowding, while the city’s consumers demand impeccable deliveries. Logistics needs a saviour; will robots come to the rescue? Omni-channel retail demands the very latest logistics technology. But where does automation end and robotics begin? A timeline exploring the history of robotics. Artificial intelligence, the buzzword of today, seems to be finding its footing online and in customer service – but what can it do for the supply chain? Robots are already being used in cutting edge logistics operations, and will become mainstream in only a few years. But where are they likely to make the biggest impact? Logistics Manager talks to industry leaders in the robotics market to find out what developments are happening for the customer, the robot manufacturer, the automation company and the start-up.